← Are speed bumps a sign of development? I’m in Bamako, the capital of Mali, in West Africa. Although I’ve been here a few months, my PhD field research is just getting started, so ‘Beginning’ seemed a suitable blog title. I know it’s also going to be the start of a continuous learning process as I investigate, in collaboration with WaterAid, the different ways in which poor rural communities contribute to water and sanitation. I’m going to use this blog to record and share some of my ongoing observations, thoughts and ideas. 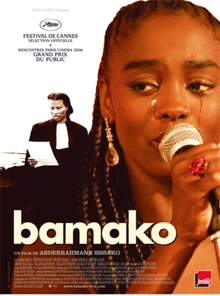 For now, I’ll leave you with an alternative introduction to Bamako: the film by Abderrahmane Sissako which takes its name from the city. It’s a brilliant picture which combines a fascinating mock-trial of the World Bank and IMF versus African civil society with moving drama and wonderful music. Highly recommended.